Inaaya Turns One And Mom Soha Is Throwing Her Princess The Perfect Birthday Bash! It just seemed yesterday that Soha Ali Khan and Kunal Kemmu welcomed Inaaya into their lives. Today their little daughter is already turning one! Frankly, if Inaaya's six-month and nine-month birthday celebrations are any benchmark, we know that Soha and Kunal will leave no stone unturned in making it a day to remember for their daughter. Mommy Soha shared a picture on Instagram earlier today, showing cute insights into Inaaya's birthday party. The picture revealed all the little things Inaaya liked to do - make animal sounds, the words she can say and even some of her favourite things to eat. 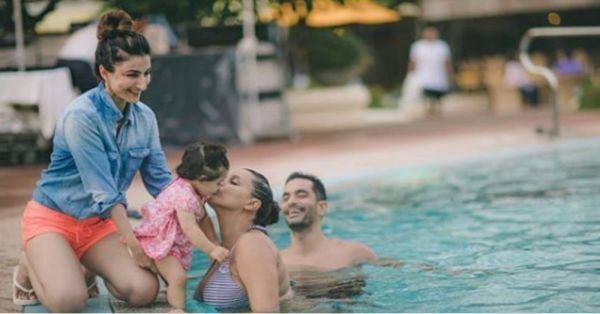 Meanwhile, Neha Dhupia, a close friend to the couple, also shared poolside pictures of her and Angad Bedi showering Inaaya with kisses. Neha, who is also going to be a mother soon, wished Inaaya all the love and happiness in the world in her post. Earlier today, Inaaya was clicked leaving the house with an adorable blue and pink coloured dress with a matching headband. Soha and Kunal have been celebrating all of Inaaya's memorable milestones as she grows older. The couple famously cut a half cake for Inaaya's 'half birthday' earlier this year. They also shared pictures of Inaaya on her 'nine months' birthday. Both Inaaya and her cousin Taimur, have been melting hearts for a while now. Earlier this year, the two of them were seen on their tropical paradise holiday to the Maldives, along Soha, Kunal, Saif Ali Khan and Kareena Kapoor Khan.